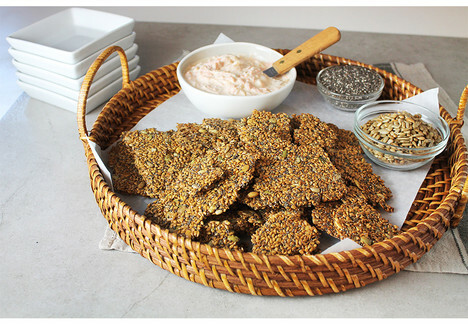 Easy to make seeded crackers with a creamy fruit and vegetable dip. For the crackers: In a medium bowl, combine all ingredients. Allow to sit for 10 minutes. Evenly spread the mixture onto two silicone covered baking sheets to a 1/4-inch thickness. Bake for 30 minutes. Allow to cool 10 minutes. Break into pieces with hands for a rustic look. For the yogurt dip: In a medium bowl, beat Neufchatel with an electric mixer for 1 minute until softened. Add the yogurt and beat until smooth. Press excess juice from the shredded cantaloupe through a sieve into a bowl. Discard or reserve juice for drinking. Add the cantaloupe and remaining ingredients to the yogurt mixture. Serve with crackers.